Learn to use conjunctive adverbs. Conjunctive adverbs, as the name suggests, function simultaneously as conjunctions and adverbs. That means they connect sentence parts while modifying a verb. They are excellent transition words that not only link ideas, but also show the relationships among them. Common conjunctive adverbs include “however,” “therefore,” “moreover,” “instead,” “thus,” “meanwhile,” “consequently,” “likewise,” and “nonetheless.” If your writing tends to be choppy or if readers are not able to follow the flow of your ideas, try improving transition by adding appropriate conjunctive adverbs. 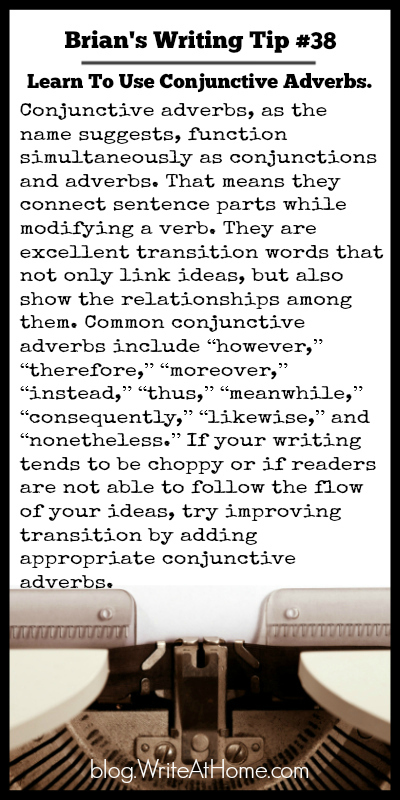 Just a word of caution: unlike coordinating conjunctions, conjunctive adverbs can’t connect independent clauses with just a comma. You end up with a comma splice. Incorrect example: Bob was a wonderful writer, however, he still needed help from an independent editor. Correct: Bob was a wonderful writer; however, he still needed help from an independent editor. Note the use of the semi colon. You could also make it two different sentences since the “however” still connects the ideas as a transition. It’s all right. But, why can’t you come up with a few examples so that every one could understand? Why would you assume I can’t?